Do you think that what you are doing will last forever? Maybe. Do you think that your importance in this world will never fade? We sometimes can be quite taken with our "place in the sun." Our egocentricities surely can get us into blurred perspective if we are not careful. However, if we are wise, we will realize our mortality. In that is our liberation. This planet is sketched with monuments displaying individuals' titles. There are plenty of name plaques, marble-this-n-that, and self-important statues ensconced around the globe. But one of these days, they all will be gone – disappeared - every one of them. What then is it that can last forever as far as your influence is concerned? Rel lives near our elderly neighbor, Bob, whose health is failing. Bob has no wife, no children, no living relative and very few friends. He spends most of his time in his cottage - very much alone except for his cats. So Rel sees to it that Bob gets to the store for groceries, is driven to doctor appointments and mails his packages at the post office. Sometimes she treats Bob to a pastry with coffee. Why? Because Rel is a believer. Jesus is God Forever. Whatever is done in Jesus' name is eternally recognized by Him. In that, kindnesses offered for His praise are lifted into the everlasting. In that, such loving gifts outlast us. One of Julius Caesar's successors as Roman emperor, Marcus Aurelius, got the message: "Perhaps the desire of the fleeting thing called fame torments you. See how soon everything is forgotten, and look at the chaos of infinite time on each side of the present, and the emptiness of applause, and the fickleness and lack of judgment in those who pretend to give praise, and the narrowness of its domain, and be quiet at last." And so then "be quiet" in service to the Ever Jesus who enfolds your kindnesses into His eternal home. Manipulating time and using the first person narrative, B. A. Shapiro has made this very smart novel a clutching story from the outset. 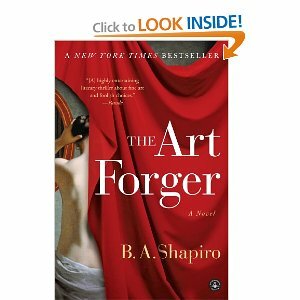 “The Art Forger”, 360 pages, published by Algonquin in 2012, is a well written mystery vibrating with the tension created when forgery collides with the legitimate world of art. The setting is the art scene of Boston, twenty-one years after the infamous Isabella Stewart Gardner Museum heist of 1990. Clair Roth is a talented artist who is struggling to make a living let alone a career out of creating her original work. Three years before the current narration, Clair’s obvious talent and consuming affair with a professor had led to trouble. When the professor was in a creative void she made a painting for him to display as one of his own in a major show. The notoriety and fame he gained on the back of her work led to a nasty predicament for the lovers that did not end well. In the present storyline, she finds herself in an analogous situation with even more at stake. This time her lover is Aiden Markel who is an influential art dealer with an underhanded scheme up his sleeve. This promises trouble for our charming, but decision-challenged heroine. With a talent for story-telling and a vast knowledge of the chemistry and mechanics of painting, Shapiro weaves a clever mystery with romance and intrigue and asks challenging thematic questions all the while. What is collecting art all about anyway? Does the collector acquire paintings for the name of the artist or for the beauty, meaning and importance of the art? To what extremes will the collector go to own art? To what depths will the artist condescend to acquire wealth and fame? The examination of these questions gives this story greater texture and bulk than a simple mystery. Clair learns that good, honest work can lead to success; but above all she must do the work to satisfy herself, not for the indulgence and approval of others. This is a book with a message and above all a fun engaging storyline. Why should I be concerned about deer ticks? Deer ticks (black legged ticks) transmit Lyme disease. Co-infections including Babesiosis, Ehrlichiosis, Anaplasmosis, Bartonella and other diseases can also be transmitted from the bite of a single deer tick. The longer the tick is attached, the greater the risk of contracting Lyme or other tick-borne illnesses. Who is likely to come into contact with deer ticks? Hikers, gardeners, children, golfers or anyone who spends time outside in Maine may encounter deer ticks. Where are deer ticks found? Deer ticks require a damp, humid environment to survive and live in wooded areas and forest edges. They like the damp, humid conditions found in leaf litter. Overgrown fields, rock walls, wood piles, and shaded ground cover plants provide additional tick habitat. Personal Protection Strategies When walking through tall grass or leaf litter, wear light colored clothing. Pretreat clothing with 0.5% permethrin, which will repel and kill ticks on contact. Apply insect repellent containing 25% DEET to exposed skin. Daily tick checks reduce you and your family’s risk of contracting Lyme and associated diseases. Check yourself, your pets and children after outdoor activities. How can I reduce my chances of encountering a tick? Make your yard less tick friendly by cleaning up your property and keeping your lawn mowed. Remove brush and leaf litter. Keep children’s play areas in the sun and away from the wooded edge. Ticks are less likely to thrive in sunlit areas. Graduation time is here and seniors and parents have mixed feelings of excitement for the future and sadness for the childhood gone by. It is a time to celebrate, but like all big milestones in our lives, it can wreak havoc on our stress levels. Stopping to take some deep breaths during this time can relax the entire body and facilitate balance. When we are running on adrenaline or responding to outside stressors, we often hold our breath without even realizing it. As we hold our breath, we starve our core. Without breath, we can’t deliver oxygen to the lungs. We become tired, moody and ill. Now, I am going to teach you how to take a deep breath and I urge all seniors and parents to try this whenever you are feeling anxious in the next couple of days. It will completely calm your entire system and your body will thank you. Lie on your back and focus on breathing in and out, deeply and slowly. If you breathe in for a count of four or five, try to slow your breath to lengthen that count to six or eight. You can breathe through your nose or your mouth; either is fine. Take in the same amount of air, but inhale more slowly. After a long in-breath, you may feel the need to exhale in a rush; after a good out-breath, you may need a quick inhale. Without judging yourself for your lack of breath, intendto expand the time it takes you to breathe, then the amount of breath you are bringing into your systems. Focus only on breathing and counting so that you will gradually increase the length of your breath. Once you have mastered this deep breathing, breathe in slowly up to a count of 30, then quickly exhale and inhale before breathing out for a count of 30. As you repeat this a few times, you have exchanged the oxygen-deficient air deep in your lungs. If you can’t reach 30, that’s okay. The goal is to lengthen your breath and physically help your body relieve stress. Just breathe….. There are those times. What does the Christian then do? First, the believer checks in with the moment. Is this moment given over to God? If not, make it so. If so, then thank God that you are still alive and sane in this moment. Second, realize that the God who brought you to this Red Sea coastline is the same God who will part the waters in His time and His way. Third, put on faith blinders. Do not try to figure out what is going on around you. Do not try to press human logic against circumstances. Do not attempt to move into the future for you simply cannot get there now. Fourth, what enemies are there standing in your way? Do they come into your head in the middle of the night? Know that when they stand there in your mind, your actual enemies are at their homes not knowing that you are being bothered by them. Therefore, you are distressed in the moment, but they are not. Therefore, surrender your enemies to God. When they come back into your head, surrender them again, pray for them again. Fifth, refuse to listen to grousers. Do not give them any power over your head or heart. Instead, as soon as they start to gossip about somebody else, or complain or pout or deride, just say kindly: "I want to keep my faith line open to God; therefore, I don't want to think nor talk like that. Let's give praise to God that our lives are kept in His love." Sixth, spread cheer. Love people, especially strangers at the store, bank, post office and service station. Smile at those you meet. Get out of your rut by getting with some children; romp with them, laugh with them. Seventh, remind yourself to "forget those things that are past," as Paul wrote. That is, discount debris that is long gone. You cannot rearrange those past moments except to put them all under divine mercy. Do that; then move on.